Featuring 50 cards. Shop for base sets on eBay. 2013 SPx Football mixes old and new. The result is a release that's based in brand tradition but still very much stands on its own. Every box includes three autographs, a memorabilia cards and a handful of other inserts. 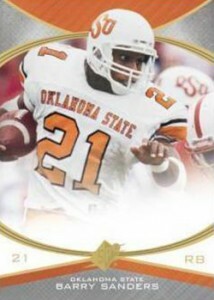 The 2013 SPx Football base set has 50 cards that draw from the rich history of NCAA football. There are also 42 Rookie Auto Jerseys. Inserted one per box, Tier 1 cards are numbered to 175. 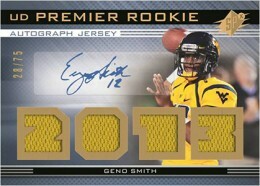 Tier 2 Rookie Auto Jerseys are numbered to 475. Collectors can also look for patch parallels (#/30) and one-of-one logo parallels. 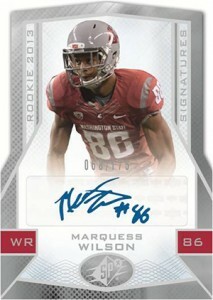 The main set rounds out with 60 Rookie Signatures cards numbered to 299 or less. The hits come from many angles in 2013 SPx Football. SPx Signatures and Super Scripts, both inserted 1:50 packs, deliver additional ink. Winning Big Materials (#/250) may only have one swatch, but they live up to their name with a larger-than-average piece. Patch versions are numbered to 10. 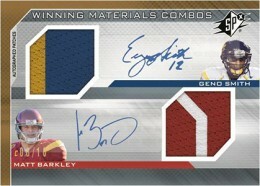 Winning Materials Combos (#/199) and Winning Materials Trios (#/99) come with memorabilia and autographs from multiple players. Shadow Box cards return, falling 1:100 packs with autographed versions landing 1:410 packs. Upper Deck is introducing Shadow Box Dual Player cards (1:400 packs). 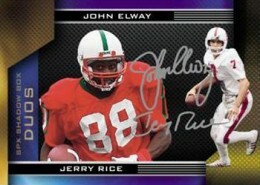 Dual-signed parallels are inserted 1:2600 packs. SPx Finite cards fall three per box. Boasting separate checklists for rookies and legends, regular versions are numbered to 899. As with past SPx Finite releases, there are Radiance (#/99) and Spectrum (#/10) parallels. 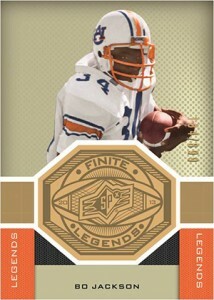 2013 SPx Football goes back to its earliest roots for 1996 SPx (1:5 packs) and 1997 SPx (1:10 packs) inserts. Inspired by the designs that launched the brand nearly 20 years earlier, the cards are highlighted by holograms. Like the original releases, both have Gold parallels as well. Every fourth 2013 SPx Football box comes with a bonus UD Premier pack. An autographed jersey or autographed patch card numbered to 125 or less is guaranteed in each bonus pack. AARON DOBSON 2013 UPPER DECK SPx AUTO-RELIC (RC) PATRIOTS-MARSHALL #475! 2013 SPX MONTEE BALL RC AUTO JERSEY 158 475!! These look great! This looks like a fresh design approach. I am excited to purchase this set. Love the looks of the product. Good balance of rookies and veterans. 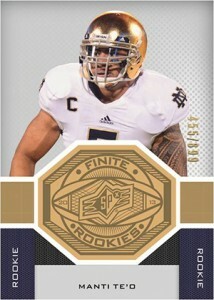 Like that they don’t have a biillion rcs(meaning its almost impossible to pull a rg3 or in this year austin, lacy etc). Two things that get rid of one star. One price of course and 2 the pack that comes every fourth box. Now collectors will be screwed again as sellers can look for the pack and sell the other boxes. My daughter came to vist on Fathers Day, a nice surprise for me was that she had purchased two packs of 2013 Upper Deck SPx. Upon opening the packs, I was extremely impressed on how Upper Deck continues to utilize great card stock. The cards were not flimsy. The feel of the card has a high end texture to it. Most impressive was the throwback cards. It helps that Upper Deck can lean on their extensive library of past designs. The representation of past and present football players were second to none. My favorite insert has to be the holofoil die cut. Price point, variations, throwback, and a good balance of rookies and veterans makes this set a very sought after product for football card collectors. Lastly, although I had only two packs to open, my whole family had fun with the 2013 Upper Deck SPx! With that in mind, isn’t this the main reason for collectors? Having fun and enjoying your hobby with family and friends! Great cards and each pack that I opened was good. I wonder about the replica jersey usage. When searching college jerseys online and looking at photos, it does appear some schools do not have sewn on numbers. I think it’s somewhat similar to the event worn jerseys that some products have. Having the autograph with the jersey makes up for it a bit, in my opinion, if they are in fact replicas. Just pulled a tier #1 Auto Patch (2 color #27/30) of Manti Te’o …nice graphics…generous patch of the Fighting Irish… UD did their work on the NCAA set! got to believe the patches are real…. �Walkoff� Jim Rushing � Memorabilia from this set comes from player-worn pieces.